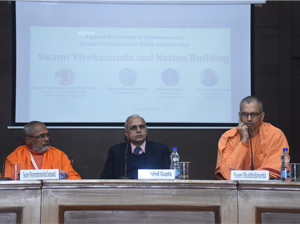 In order to commemorate Swami Vivekananda’s 156th birth anniversary this year, the Vivekananda International Foundation (VIF) organized a panel discussion on ‘Swami Vivekananda and Nation Building’ on 17th January 2019. The panelists were: Param Pujya Swami Paramatmananda Saraswati, Secretary General & Coordinator of Hindu Dharma Acharya Sabha, Swami Shuddhidananda, Ramakrishna Mission, Kolkata, Kum. Nivedita Bhide, Vice-President, Vivekananda Kendra, Kanyakumari, and Shri Dhanendra Kumar, Former Secretary, Government of India. Swami Paramatmananda said how monkhood is misunderstood today as a state of insensitivity and indifference towards one’s surroundings. Swami Vivekananda came to demonstrate that it is otherwise. He said let India be our keynote for the next fifty years. In a country divided by caste, creed and religion, progress is difficult to achieve. A country can progress only if each and every citizen can progress. Law or government cannot ensure the progress of society. It is always society that has to get working for its own welfare. Till women achieve progress, there can be no progress for the nation. If India has to become a vishwaguru once again, all these conditions for progress have to be ascertained. Speaking about Vivekananda, Paramatmananda ji said that here was a man with a burning urge to realize God, yet he gave up a detached spiritual life for the welfare of the motherland. Swami Shuddhidananda said that in 1896 in England, Swamiji declared that India was chosen by Providence to give a new civilization to the world and India had been doing that for ages. He asserted that India will conquer the world with her spirituality. We, Indians, have no other alternative—we have to do this or die. But before India can give a new civilization to the world, India has to be re-built by her citizens. This program of nation-building cannot be thought of only in economic terms. Of course, in a country, where so many people live below the poverty line, it is imperative to think about material well-being; however, that alone is not sufficient. What are the most glaring obstacles in the path of nation-building in India? It is worth pondering upon: how is that that a handful of British people could rule a country of millions? It is because our minds and wills are not united. So, we also have to think about what truly unites us as a nation. Any kind of political process or legislation cannot bring about true unity. What truly unites India is her spiritual and moral culture—it is the only thing that can keep us together in the face of divisive forces. Therefore, the first step in nation-building would be to introduce this culture into the education system. Nivedita Bhide pointed out that Swami Vivekananda came at a time when Indians were lost in a spell of self-forgetting, when the purpose of life seemed lost and when there was no self-confidence. At such a time, he came and preached his bold message. Swamiji declared that his only hope was with the youth—they will work for the nation. At such a time, he said men are nobody to decide for women what is good for them—women should only be provided education and given the freedom to choose their path. As per a recent report of the United Nations on women’s safety, India fares much better than other countries. This is because we realize that the safety of women does not lie in any law or legislation, but in the eyes of a man—which can only be determined by samskaras, or inculcation of values. Women have to participate equally in the process of nation-building. She said that according to Swamiji, the following are required if we wish to do anything for the country. First, we must have a heart that can feel for the poor. Yet feeling alone is not enough. We must exert our brain and think of a plan. Finally, we must have indomitable will to execute that plan. When one of Swamiji’s followers, Josephine MacLeod, asked him what she could do for him, he replied—love India. We have to love India as she is. Any amount of complaint that India is like this or like that will not change anything. It is only the day we start thinking what we can do for India is the day that something will change. Love that brooks no difficulty—when that kind of love one has for India, that day something will change. Dhanendra Kumar reminded the audience that Swamiji had asked for muscles of iron and nerves of steel to work for the nation. He also said it is important that Swamiji’s vision be translated into actual policies of the government. The talks were followed by an interesting round of discussion, where many from the audience asked pertinent questions.